Don’t be discouraged from growing fruit just because the space in your garden is limited. Even if there is insufficient room for apples or pears, many container gardens can support currants or one of the unusual berries. These take up little space and are seldom found in the grocery store. And don’t forget the ever-popular strawberries! Currants – they grow well in cool temperate climates and make a good alternative for the patio gardener who lives in a colder climate. Black, red, and white currants can all be grown in containers against a wall, and can be trained as cordons or espaliers. Hybrid Berries – some of the hybrid berries, thornless blackberries, tayberries, and loganberries can be grown in a container against a wall. They do need a framework of wire but they are easy to train. Strawberries – the favorite fruit for the patio gardener. Strawberries are especially attractive grown in special planters or tubs, with white flowers in late spring and delicious red fruits ripening in summer. They can also be grown in growing bags, planted in late summer to bear fruit the following year. 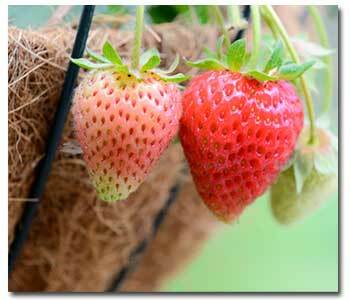 It is possible to retain strawberry plants in growing bags for two years but it is probably best if they are replanted annually. Since they are a greedy crop, make sure you add a slow-release fertilizer when you plant them.